With a bag full of apples, I waded through throngs of kids into Thomson Elementary School. My friend Shayna Tivona—Ms. Tivona to her 17 pre-K students—had invited me to take a break from my work on a small Pennsylvania farm and visit her class for their unit on trees. The three-, four- and five-year-olds had already come up with some excellent questions: What is a seed? How do trees grow up? What food comes from trees? Students were eager to talk to “Farmer Julia,” telling me about trees they had seen and fruits they had eaten. I passed around four different apple varieties and students shared observations as they held, shook and sniffed the fruit. A few years ago a friend offered to cook for me. He told me he was making a slaw. It took me a moment to understand what he meant. Slaw? Like cole slaw?! Mayo-coated cabbage? "I love slaw," he said. Yup, slaw. And soon thereafter I was convinced. Since then I've made dozens of slaws, serving them as side dishes and main courses. I've had it slid into sandwiches, spread onto tacos, and scooped onto soups. Cabbage is the traditional base for slaw, and with good reason. Cabbage has a great, crunchy texture, plus it's super healthy and inexpensive. Cabbage is harvested at the end of the fall. The cold-hardy vegetable be placed in your refrigerator and kept well into the winter. If outer leaves start to yellow or wilt, simply pull them off and dig into the inner layers. You can easily use the light green and bright purple round heads for the base of your salad. Simply slice the whole heads into long, thin strips. The dense heads will produce a shocking amount of slaw once the strips are fluffed up, so have a nice big bowl handy. Big round cabbage heads aren't the only possible bases for your slaw. Napa cabbage, with it's light, crinkly leaves, is also an excellent base (on its own or mixed with traditional cabbage heads). Brussels sprouts, a close vegetal relative to cabbage, can also be used as a slaw base. Slice the sprouts thinly, taking out the solid base, and fluff as you would with cabbage. Brussels sprouts can be eaten raw, though some prefer to quickly wilt them in a pan with hot oil. Alternatively, skip the base and just get creative with the fillers. Carrots can make a great salad base, as you may have read earlier on the blog. Smitten Kitchen has a great recipe for broccoli-based slaw. As people get more adventurous with vegetables, I've heard more and more about the merits of slaw made with kohlrabi, an alien-looking relative of the cabbage. The key to slaw is your own creativity and the bounty of items that can be added. It's important to make a plan and not just add things willy-nilly. At the same time, let yourself be creative and adventurous; don't limit yourself to this list of suggestions. If you have a mandolin, slaw is easy, a most of the veggies can be run along the tool to get uniform matchstick pieces. If not, consider grating the most solid add-ons, and thinly slicing more tender additions. Some items, like nuts or grains, can simply be sprinkled on at the end. A basic mayo-based dressing can be good for some. It's made of mayo, with a little honey, vinegar, salt and pepper. Smitten Kitchen has a great buttermilk dressing, which they put on a broccoli slaw and a napa cabbage salad. Since we don't eat a lot of dairy, I usually opt for a mayo-free slaw, often taking it in an asian direction. I combine soy sauce, a little sesame oil, ginger, and mirin (rice wine vinegar), sometimes adding cayenne or Sriracha sauce for added kick. Other good dressings can be made with ingredients like lemon or lime juice, olive oil, cumin, and fresh garlic. The farm fields are looking sparse, but that doesn't mean you have to stop eating seasonal food. Long before we had refrigerators to keep things fresh, and airplanes to carry pineapples to Canada, folks found ways to survive the winter with what they could grow and keep. Enter: winter squash. Despite the name, winter squash grows in the summer, slow and steady. The plant's winding vines spread yards away from where it is planted, tangling with its neighbors until it's unclear what grew where. In the fall, before it gets too close to a freeze, we wade through this mess to see what we can reap. Sometimes the vines will shrivel and die, letting us "collect" squash more than "pick" it. A "cured" squash will be sweeter than a fresh one and will have a stronger skin. It will keep much longer in your kitchen, where it should be kept in a cool, dry place. 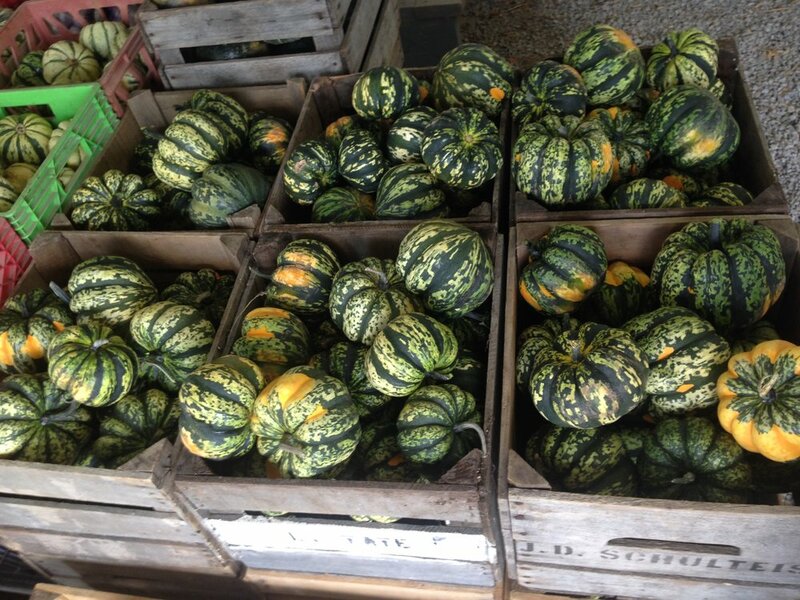 Check out the Washington Post for more on curing and storing your winter squash. Winter squash come in a broad range of shapes, sizes, and colors. The most common are the green, creased acorn squash, the bowling pin-shaped butternut squash, the oval striped delicatta squash, and of course the Halloween favorite -- the pumpkin. Want to impress your friends with more exotic types? Tell them about white pumpkins, pink banana squash, or blue hubbards. While they may cook at different speeds (so check them often! ), many types of the squash can be used interchangeably in recipes. My go-to way of cooking winter squash is roasting it. Not only does it bring out the rich, sweet flavor of the squash, but it also warms my house with the oven going on cold winter nights. Soup is a perfect winter-time treat with squash. They really lend themselves to the velvety texture you look for in a blended soup, and the taste can be taken in very different directions. There's plenty to say about savory tarts and galettes (that's a free-form pie, made on a flat baking sheet), but much of it will have to wait for another day. I do want to mention, though, that roasted squash (following the methods laid out above) is excellent in a savory tart or galette. This year for Thanksgiving I made a variation on the New York Times Kuri Squash, Mushroom and Kale Tart with Rosemary Crust (at left). I use either the Smitten Kitchen crust (check out their excellent recipe for Butternut Squash and Caramelized Onion Galette) or the Chocolate and ZucchiniOlive Oil Crust, which is vegan and very easy to make. With a crust in hand, a smooth squash layer can be enough, or add some extra veggies on top for an impressive dinner. Not all squash are destined to be spaghetti, but the aptly-named spaghetti squash sure is. The flesh of this unique squash, when roasted (in the first manner, above) results in a mess of thin strands of squash. Scoop out the cooked squash and top with a favorite pasta topper (tomato sauce, pesto, or anything else). Folks will be shocked to hear it's not pasta (and gluten free!). Growing up, Halloween was marked by costumes, candy, pumpkin carving, and of course, pumpkin seed toasting. But pumpkins are just one of the many winter squash with tasty seeds. Before tossing your seeds in the trash, consider separating them from the squash flesh, tossing in a little oil and salt, and toasting them in the oven at about 350º until browned. You'll have to stir and check them often to prevent burning, but the salty snack is worth it. They make a great addition to salads or topping to your squash soup. Looks like they should have made the list of 8 Veggies Where You're Missing Half The Fun, too!